The Release of Guarantee Form allows a guarantor to free themselves from being financially and/or legally bound to a contract. This is common for loan agreements and lease documents after expiration or when the contract has been fully satisfied. The release is recommended, although not required, to be signed in the presence of a notary public. Guarantor – The party that is seeking the release. Releasor – The party that is giving the release. Historical view of all financial statements. Business projections that address the current economic state. Strengths the business has shown in previous years and may show in future years. Potential weaknesses the business may have along with a mitigation plan. Additional collateral as a substitution for the personal guarantee. The financial institution is not obligated to grant a Release of Personal Guarantee. In the event the Release of Personal Guarantee is not obtained, a most frequent way to receive the release is to pay off the business loan or refinance the business through a private equity firm. At the time the loan is paid in full, a Releases of Personal Guarantee is automatically completed, as part of a contractual clause. This Release form can be downloaded as one of three files: Adobe PDF, Microsoft Word (.docx), or Open Document Text (.odt). You may click any of the links within this paragraph or any of the buttons beneath the image to access this form. Select the file type you prefer then open and save this form. You will need to enter some information onto this form in order to utilize it correctly and apply it to the purpose at hand. You may enter this information on screen if you have downloaded a file type compatible with your editing software or you may print it then physically type in the information where required. Locate the first three blank spaces in the Introduction, then record the Calendar Day (i.e. 1 – 31), the Name of the Month ( i.e. January, February, March, etc.) and the two-digit Year that define the start date of this document’s effective terms. The Guarantor will be the first party we will need to identify. His or her Full Name should be supplied to the blank space after the phrase “…Is By And Between.” The Identity of the Guarantor will also need to be validated in some way. This may be done by reporting the Physical Street Address of the Guarantor on the next blank space. Then on the spaces following the terms “…City Of” and “State Of,” enter the Guarantor’s City and State. Note: You may not report a P.O. Box as an Address. Next, we must Identify the Releasor in a fashion similar to the Guarantor’s report. First we will fill in the Full Name of the Releasor on the next available space. The last three blank spaces of this introduction should have the Street Address, City, and State of the Releasor recorded on them (in that order). Locate the Title of the Document this Release shall be applied to. 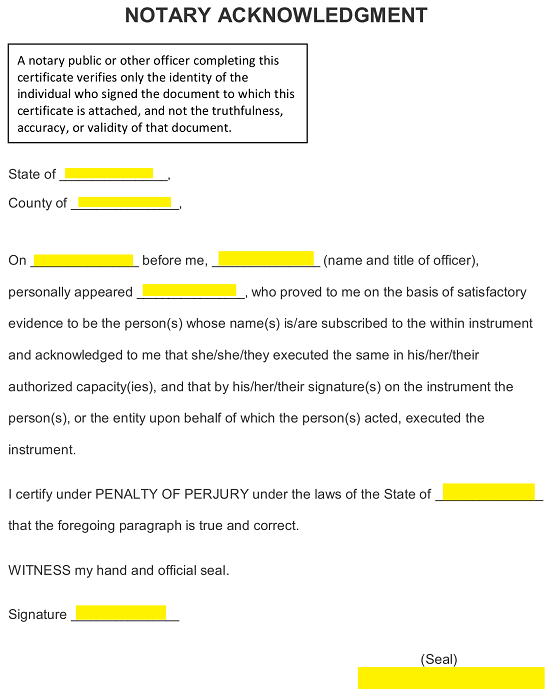 Enter the Title of the concerned Document on the blank space preceding the bracketed label “[Name Of Document]” in the paragraph labeled “Whereas.” The next three spaces in the “Whereas” paragraph have been provided so you may record the exact Execution Date of the Document this Release shall be applied to. Finally, report the State that governs the terms in the Release or Termination form being executed here. The Guarantor must sign his or Name then enter the Date he or she signed this form on the blank spaces after the words “Guarantor’s Signature.” The Releasor, named in this form, must also sign his or her Name and provide a Date Of Signature. 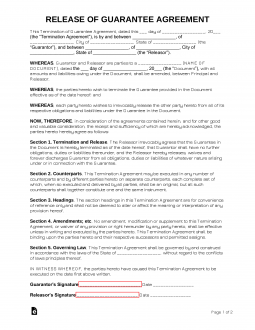 The Releasor should provide these items on the blank spaces after the words “Releasor’s Signature.” The last page, “Notary Acknowledgment,” shall provide the area and structure to have the Guarantor and Releasor Signing Notarized. The Notary will issue any instructions necessary for this process and will supply the required information in the requested areas. Make sure to review this area, once it has been completed.